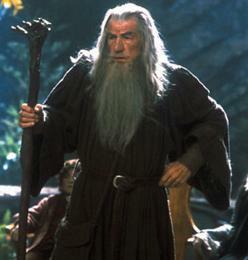 Ian McKellen has symbol on to return as wizard Gandalf in "The Hobbit," the two-pic adaptation of the J.R.R. Tolkien novel being directed by Peter Jackson. The dealmaking on Hobbit for a slew of Jackson veterans from his "Lord of the Rings" trilogy has been coming fast and angry and comes on the heels of Andy Serkis finally inking his deal to reprise Gollum. "The Hobbit" book introduced Gandalf and Gollum, with both characters going on to become part of literature's most popular characters. Gandalf sets the escapade going in the story and appears throughout the novel. Gollum come into view in a chapter that has gone on to be one of the most memorable in all of fantasy literature. Elijah Wood signed his contract to return as Frodo last week, and Cate Blanchett will play Galadriel once again. Orlando Bloom has an offer to go back as elf archer Legolas, though it's too early to tell if a deal will be made. McKellen, who was selected for an Oscar for his portrayal of Gandalf, has spent recent years doing mostly voice work for film and TV, although he did star in the reconstruct of AMC's "The Prisoner." His last major film role was in 2006's "X-Men: The Last Stand."